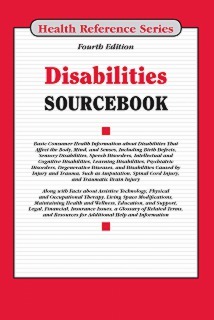 Disabilities Sourcebook, Fourth Edition offers people with disabilities and their caregivers basic information about birth defects, hearing and vision loss, speech disorders, intellectual and cognitive disabilities, learning disabilities, and other types of impairment caused by chronic illness, injury, and trauma. It discusses assistive technology, home use devices, mobility aids, therapies, and services that foster independence. Information about the importance of nutrition, exercise, personal hygiene, and pain management is also provided. For parents of children with disabilities, the book offers facts about special education, including early intervention services, individualized education programs, and classroom supports. Legal, employment, and financial concerns for people with disabilities are also discussed. The book concludes with a glossary of related terms and directories of resources for additional help and information. This book is divided into parts and chapters consisting of related information. Furthermore the chapters are designed to concentrate on a single topic to make it easier for the readers to gain information on their areas of interest. Part I: Introduction to Disabilities discusses the prevalence of physical, cognitive, emotional, and sensory impairments. It provides statistical data of on people with disabilities in the United States. It identifies common barriers that people with disabilities face in mainstream society, such as access to housing, employment, and education, and it offers tips on communicating with and caring for people with disabilities. It explains the effects of aging on disabled people. Abuses sometimes encountered by people with disabilities are also discussed. Part II: Types of Disabilities identifies the symptoms, diagnosis, and treatment of the most common forms of disabling conditions, including birth defects, cerebral palsy, cleft lip and palate, inherited disorders of metabolism, muscular dystrophy, spina bifida, arthritis, sensory disabilities, speech disorders, intellectual and cognitive disabilities, learning disabilities, autism spectrum disorders, attention deficit hyperactivity disorder, psychiatric disabilities, degenerative diseases, and disabilities caused by injury and trauma. Part III: Technologies and Services That Help People with Disabilities and Their Families provides information about devices, therapies, and supports that help people with disabilities attend school, engage in work, and enjoy recreational activities. Facts about mobility aids such as canes and wheelchairs, home use medical devices, communication and hearing aids, and low vision devices are discussed, and information about speech, occupational, physical, and recreational therapies is provided. It also discusses the accessible transportation systems available for the people with disabilities. Part IV: Staying Healthy with a Disability discusses strategies for maintaining physical health and emotional wellness in people who have disabilities. Patients and caregivers will find information on healthy eating, weight management, personal hygiene, and physical activity, as well as tips on managing bowel and bladder problems, pressure sores, pain, depression, and anxiety. The part concludes with an explanation of health insurance concerns, tips on dealing with hospitalization and rehabilitation, and considerations when choosing a long-term care setting. Part V: Special Education for Children with Disabilities identifies laws that support the education of children with disabilities, such as the Individuals with Education Act (IDEA), the No Child Left Behind Act, and Section 504 of the Rehabilitation Act. Facts about evaluating children for disability, early intervention services, individualized education programs (IEPs), and supports, modifications, and accommodations for students are also included. Part VI: Legal, Employment, and Financial Concerns for People with Disabilities describes disability rights laws that protect people with disabilities from discrimination. It also discusses housing and safety issues for people with disabilities and addresses employment and workplace concerns, Social Security disability benefits, tax benefits, and credits for diabled people. The part concludes explaining the stratergy of preparing the people with diability for the future—end-of-life planning. Part VII: Additional Help and Information provides a glossary of important terms related to disabilities. A directory of organizations that help people with disabilities and their families is also included, along with a list of summer camps for children with disabilities, a list of organizations for athletes with disabilities, and resources for finding financial help for assistive devices.